Jandi from Jandi in Stitches, invited me to participate in the Handmade Holidays blog tour this week. I am always looking for Holiday gifts to give that are handmade or that I can make myself. 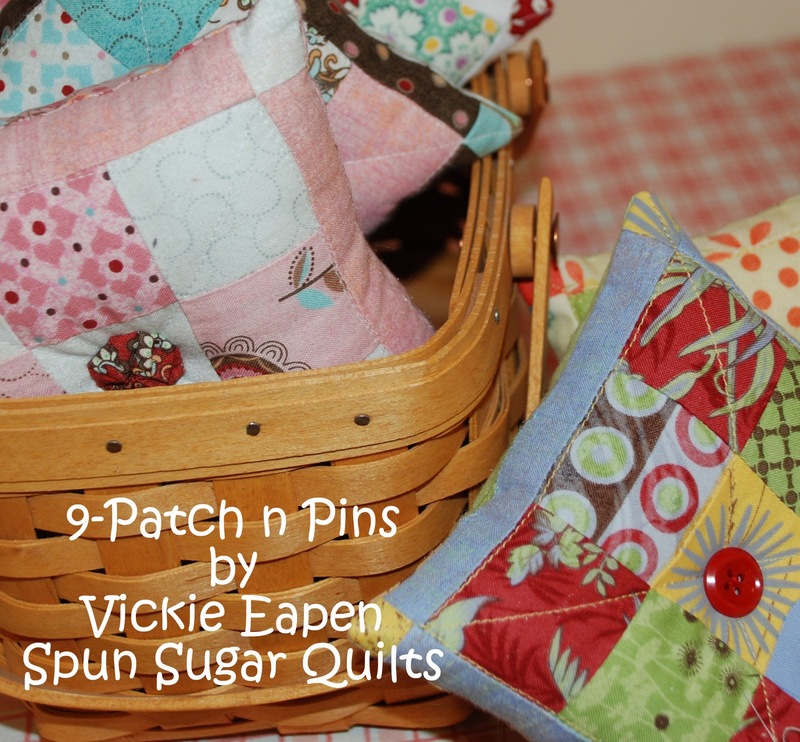 This year I have several quilting/sewing buddies that I'd like to give a pincushion to as part of their gift. I decided to create my version of a 9 patch pincushion. batting scrap 6" X 6"
backing fabric 5.5" X 5.5"
Begin by laying out your arrangements as shown. Sew together the 9 patch center. Sewing first into rows of 3. Then sewing the rows together to form the 9 patch. Here is an example with the center sewn. It should measure 4 1/4" square. Next take 2 light strips and sewn them to opposite sides of the 9 patch. Examples in Basic Grey, Sandy Gervais and Darla by Tanya Whelan. Next sew the 1" squares to the side pieces as shown. Now sew the pieced side to the 9 patch. I chose to quilt them all at once with a larger scrap of batting. Sew a giant X through the center of each cushion block. Then outline the center 9 patch square. Trim all the excess batting away. Now layer the pincushion top the the bottom fabric right sides together. Sew on the perimeter 1/4" seam allowance, leaving about a 1" opening on a side for turning. Turn, stuff, pin and whip stitch closed. To create the dimple in the center. I take a coordinating thread and a doll maker's needle, start at the top of the pincushion and draw up the center. The knot will be covered with a button or tiny yo-yo. Oh, so cute and decorative! These are great! Definitely will make some. Thanks for sharing! Great little gifts and quick too! So cute, Vickie! They would be fun to make as well. Awesome! I loved how you saved time by quilting them all together on the larger sheet of batting. At least this gives me an idea fo something quick that I can whip up in no time! Very sweet! I was just thinking that these would make awesome ornaments, especially with a hand-written note and date on the back. Even better: the ornament could first be used as a gift tag for the recipient. What a cute project! Thanks! 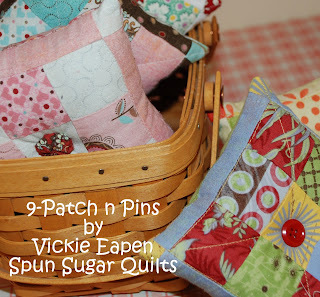 Such a cute pincushion...thanks for sharing, Vicki! Who wouldn't love to get one of these lovlies in their Christmas Stocking. Adorable....thanks for the great gift idea! Another great tutorial, Vickie! Adore all the pincushions, especially the 30s version!! How fun! Thanks so much for posting such a great little project! These are just adorable! Thanks for the tutorial! Oh, thank you. I really need pincushions and have seen several that were too hard for me to do quickly. But I can do this one and will have one by this time next week. Thanks so much. Great little gift! Thanks for sharing, the photos are great! Love this tutorial!!! Thanks for sharing. I need to make some of these! !